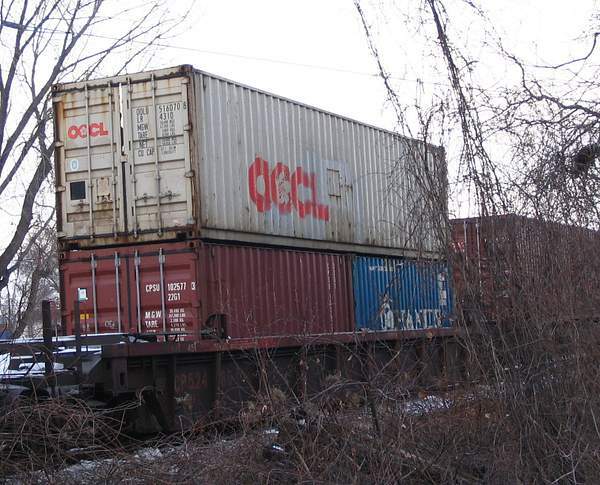 April 13 2007 A CP Riail System Genset to provide power for reefer containers . This was on Train 142 that was on the CN Oakville Sub passing through Port Credit. 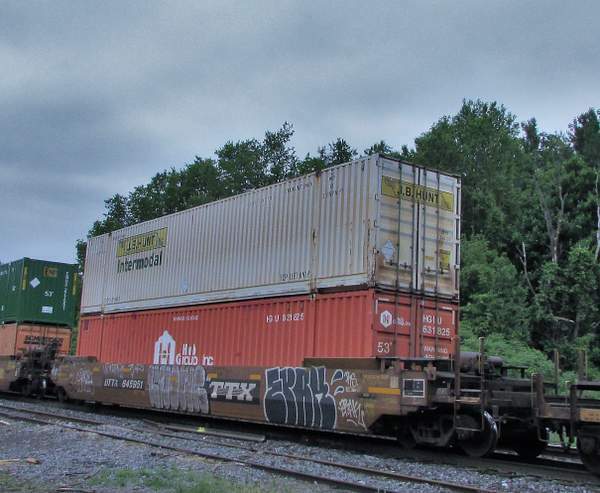 This 5 place container car car sitting at Guelph Jct . on the Canadian Pacific .Whether waiting for another train or some sort of mechanical impossible to tell. This is the point where the Hamilton Sub from Welland joins the Toronto - London Galt Sub. 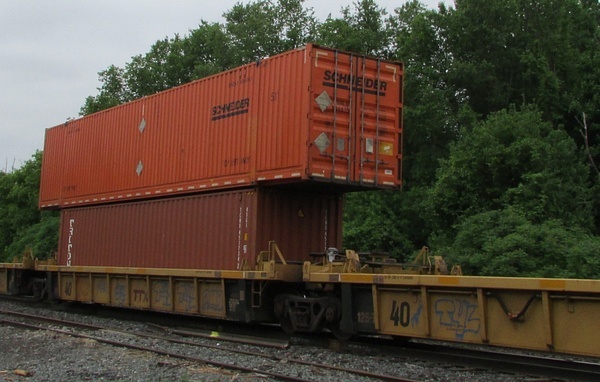 A CP 64 foot flat car equipped for moving single stacked containers. 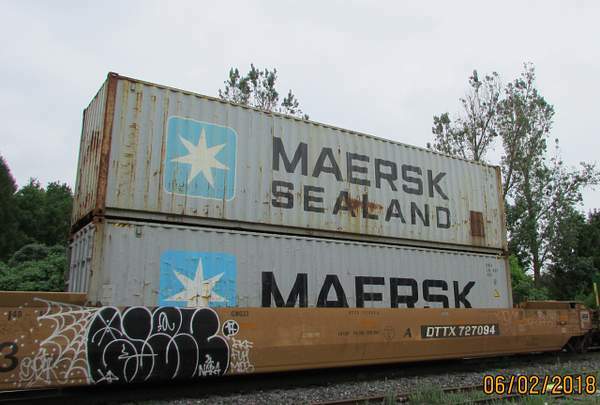 Blt circa 1971 or 72 Marine Industries Possibly withdrawn in 2001- 2003 period. This is a well of a 5 well car set headed east of Galt on CP. 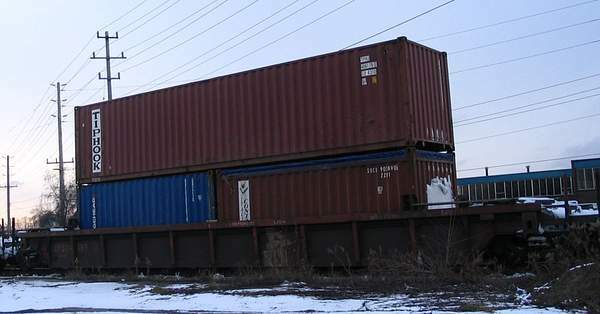 January 8 2006 Ocean containers for the Obico yard sitting on a siding at SNS Kipling. 3 of 5 wells were visible. 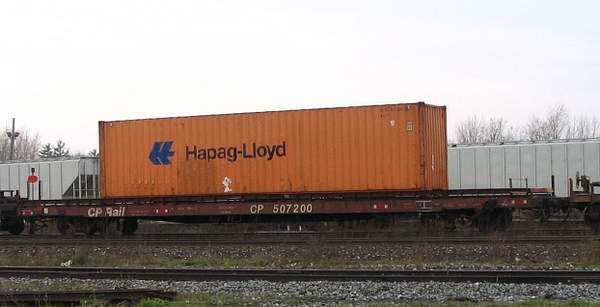 CSAV is the logo for CSAV- Norasia which is owned by Hapag - Lloyd. 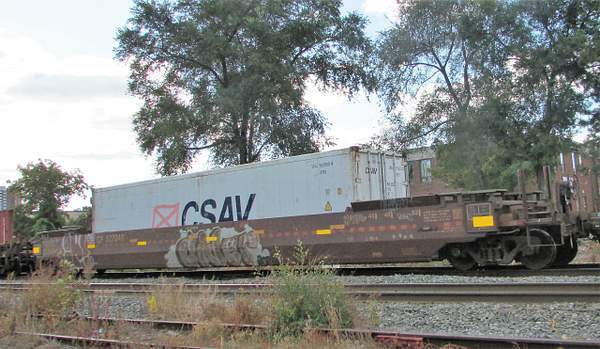 Moving on a CP company operated well car. 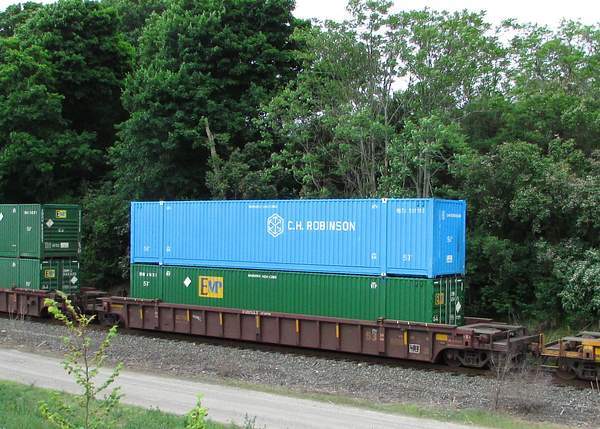 CH Robinson 53 foot domestic container riding on CP train 142 June 2 2018. 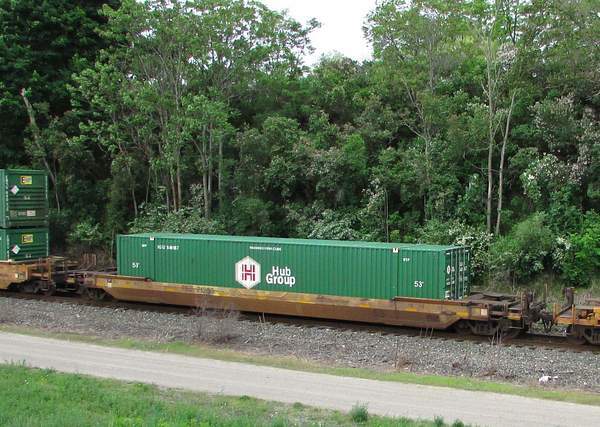 CP 53 foot well car set. 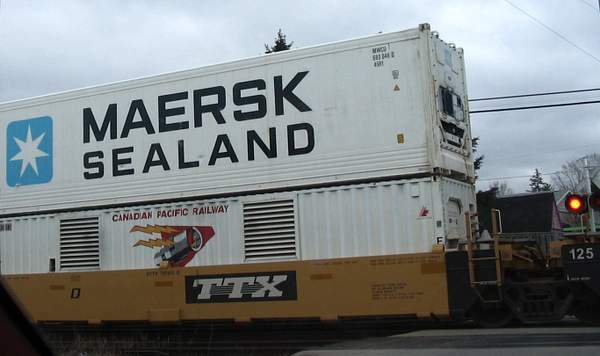 April 13 2007 Here is a 40 foot CP Genset providing power for reefer containers like the Maersk Sealand box loaded on top. Train CP on the CN Oakville sub. 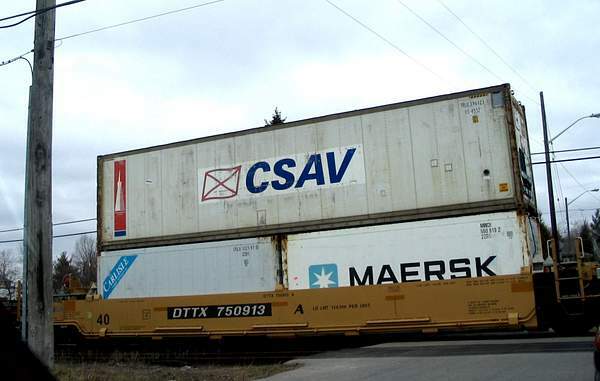 This was the last car on an eastbound container train passing Puslinch west of Guelph Jct. on the CP Galt sub. 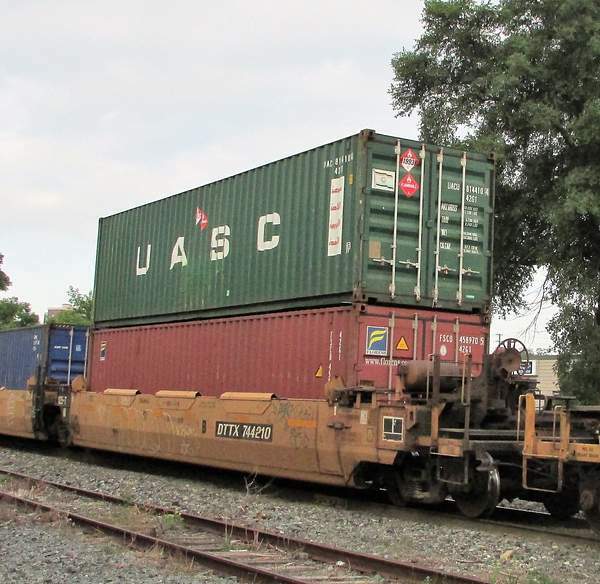 Unknown train number since CP 142 usually operates from Buffalo via Welland on the Hamilton Sub. 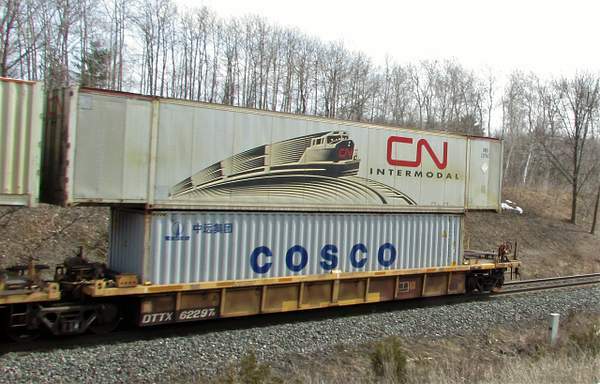 CN 53 foot domestic container rides on top of of a 40 foot international container in a 40 foot well car. 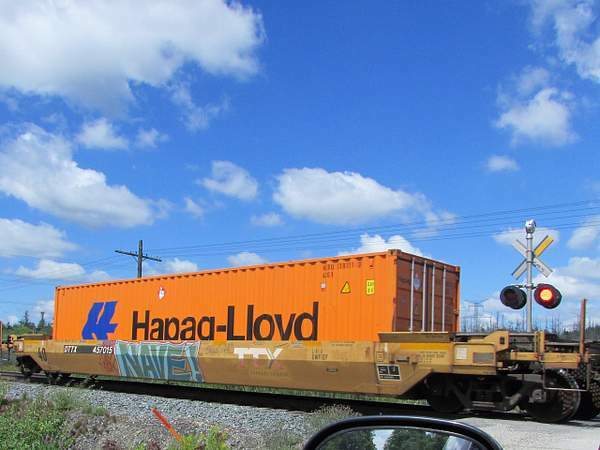 Train 148 at Copetown. Some container well cars have 5 wells linked together to form a single container car. DTTX 62297 seen on CN train 148 is a typical 5 well car. 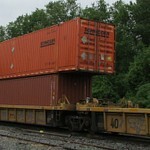 It has CN domestic 53 foot containers loaded on top of ZIM/COSCO 40 foot export boxes. Train CN 148 Chicago to Montreal via Brampton. 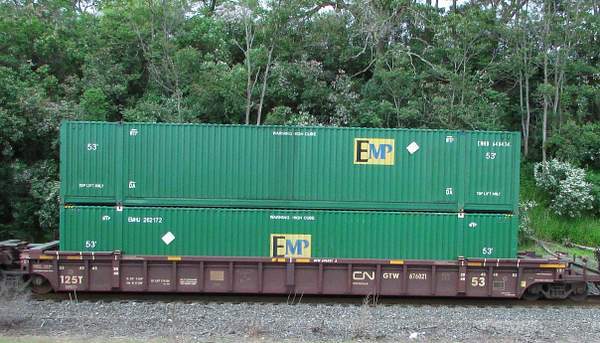 Both domestic containers . Couldn't trace. 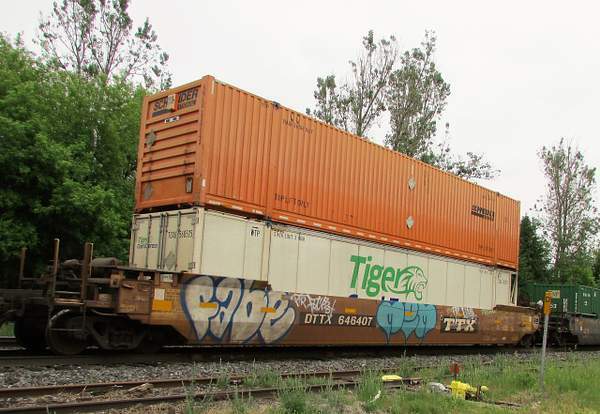 Tiger Cool Express is a domestic reefer container operator. Toronto is not shown as a network point. 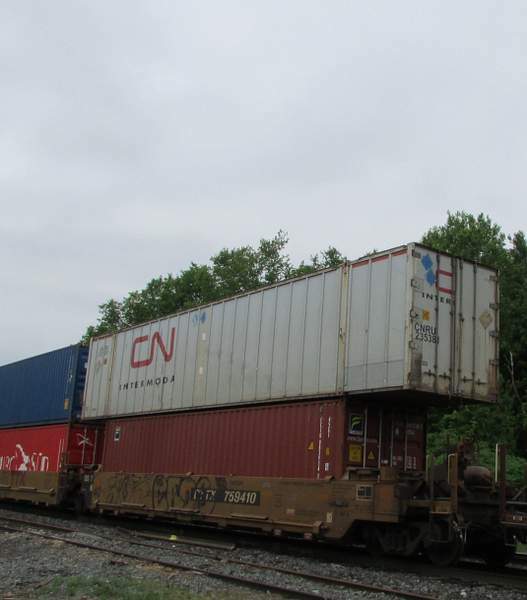 CN Train 148. 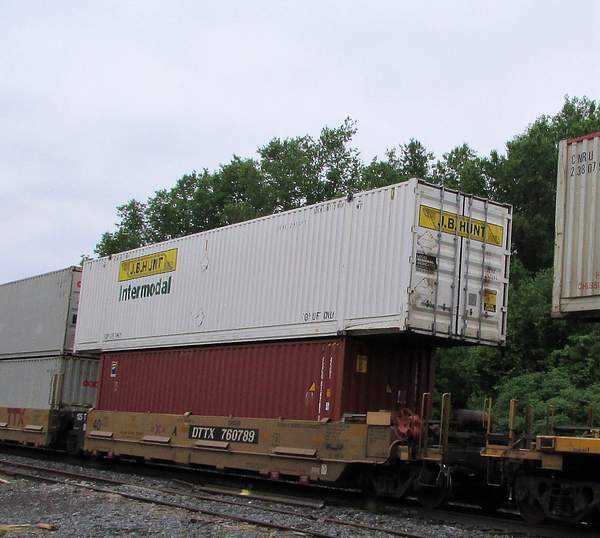 Detroit to Genoa by truck, CN to Halifax and sea beyond. 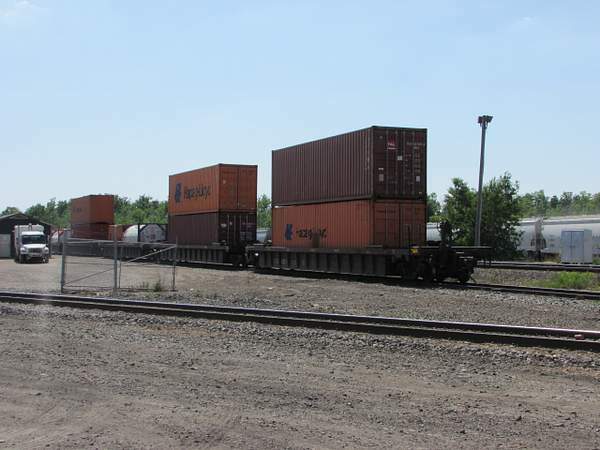 All three well are loaded with CN 53 foot domestic containers. 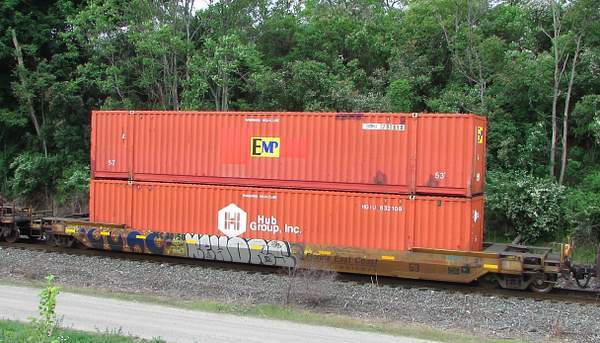 No numbers are legible but probably export containers from Chicago to Europe via Halifax. 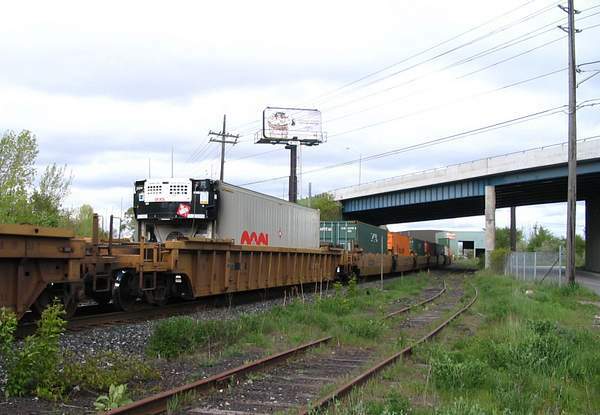 CN TR148. 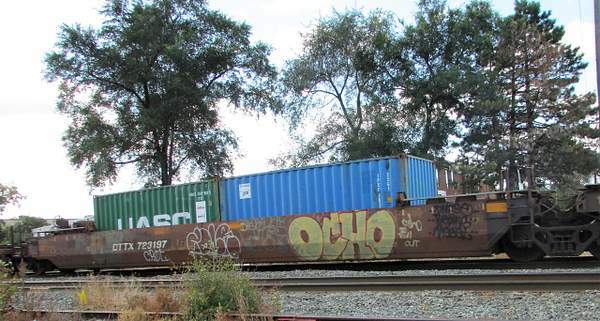 CP train 142. Loaded with Hub Group 53 domestic under EMP 53 domestic. 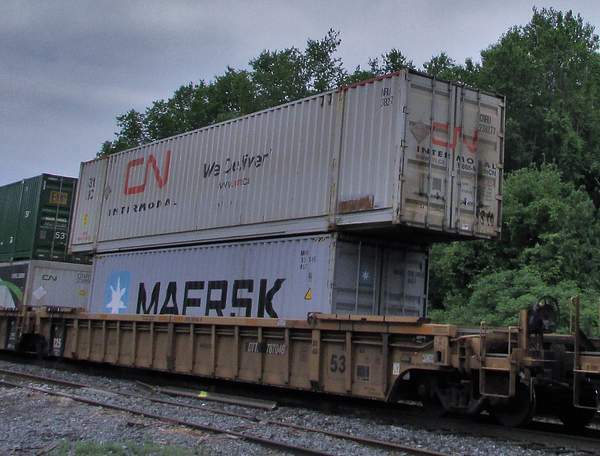 July 2013, a complete 5 well shot of this articulated car on CP train 143. 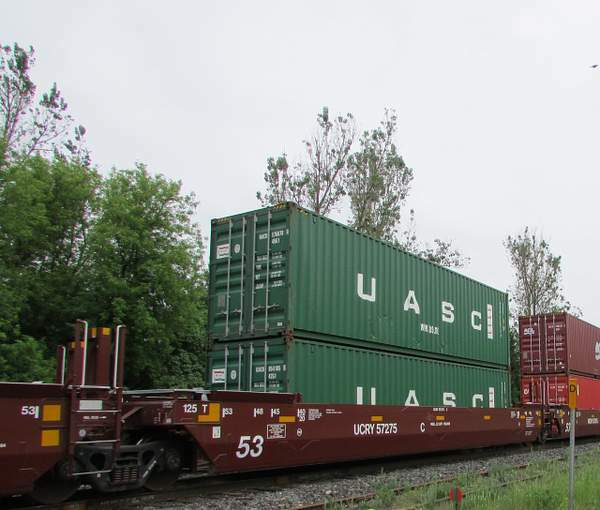 Montreal Hochelaga to Chicago Bensonville via Cleveland (CSX) with a mix of OOCL and HCLU containers. April 13 2007. 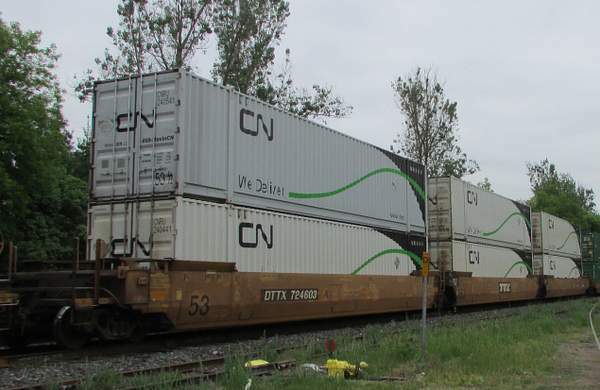 CP container train on CN Oakville Sub (former TH&B trackage rights) Probably TR 142, Bensonville (Chicago) to Hochelaga (Montreal) via Cleveland. 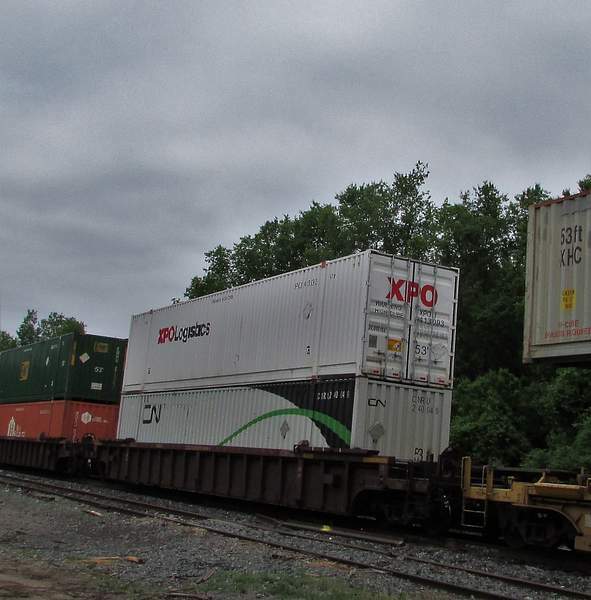 On train CN148 ISO 40 footer in well with a CN 53 on top. 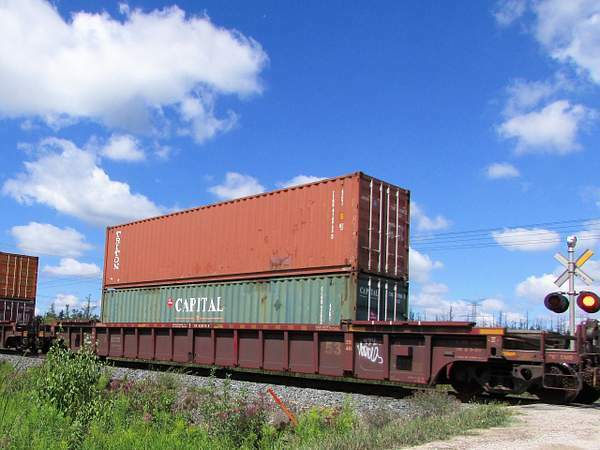 CP TRAIN 142. 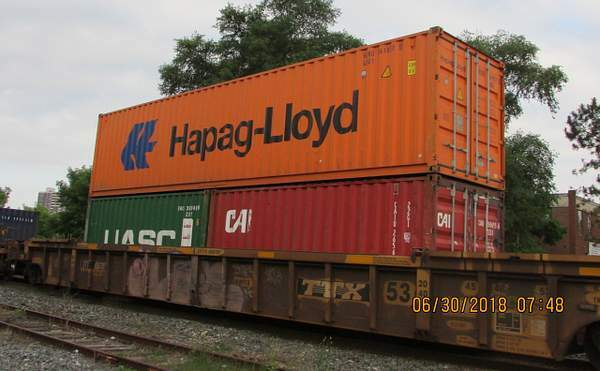 The GOLD 40 and UASC 20 are leasers for Hapag Lloyd. 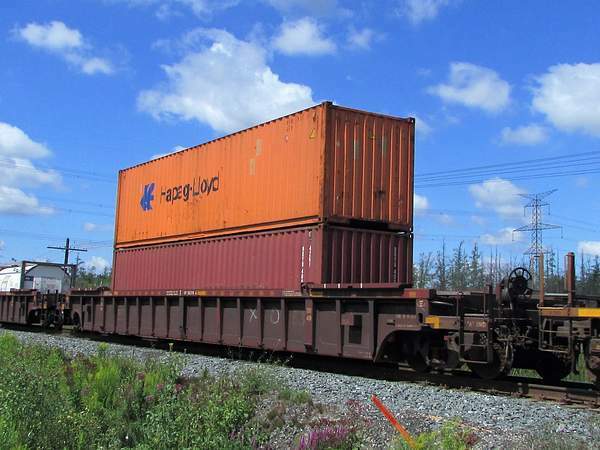 The 40 well car is a remanufacture by TTX. It can carry 2 x 20 and 1 x 40 or 1x53 on the top position. 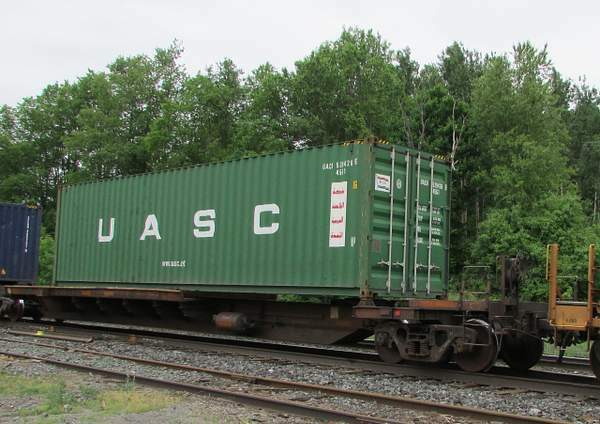 Train CN 148 June 2 2018. JBHU over a Florens 40 footer. 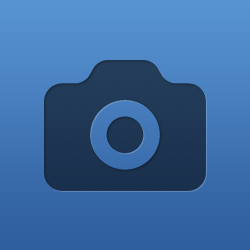 Copetown ON. JB Hunt over Schneider National. 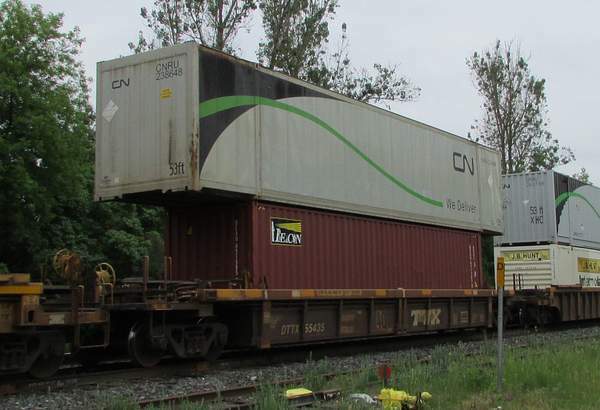 CN Train 148 13-11-15 Powerline Road Brantford. 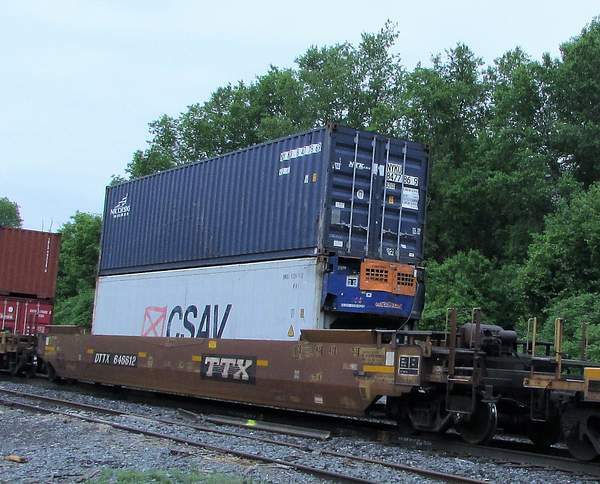 53 foot well car with 40 foot in lower position and 53 on top. 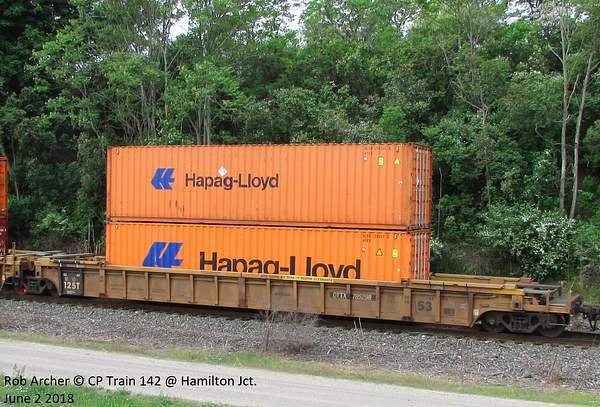 Containers on CP Train 142 . 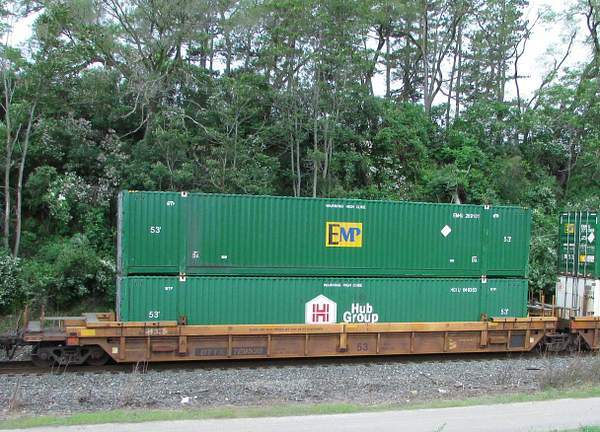 The EMP container is likely a rebadged HUB Group box. 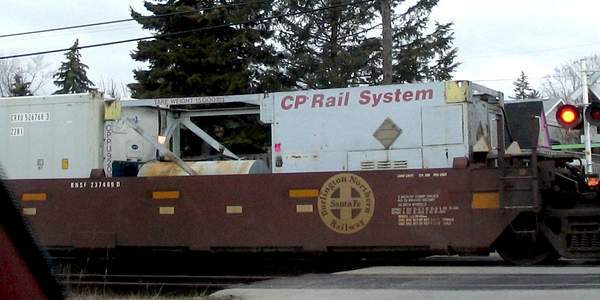 CP Train 142. 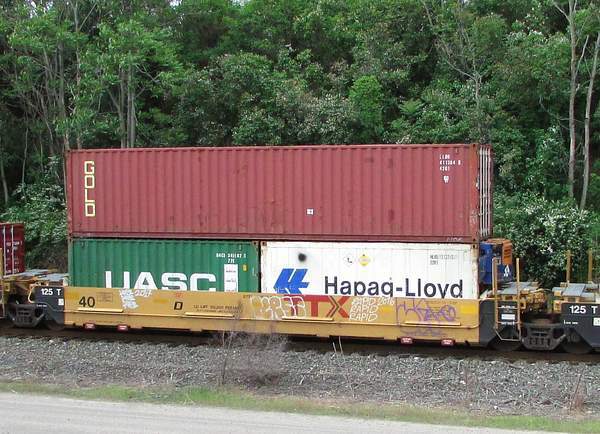 This car has Florida East Coast (FEC) reporting marks. 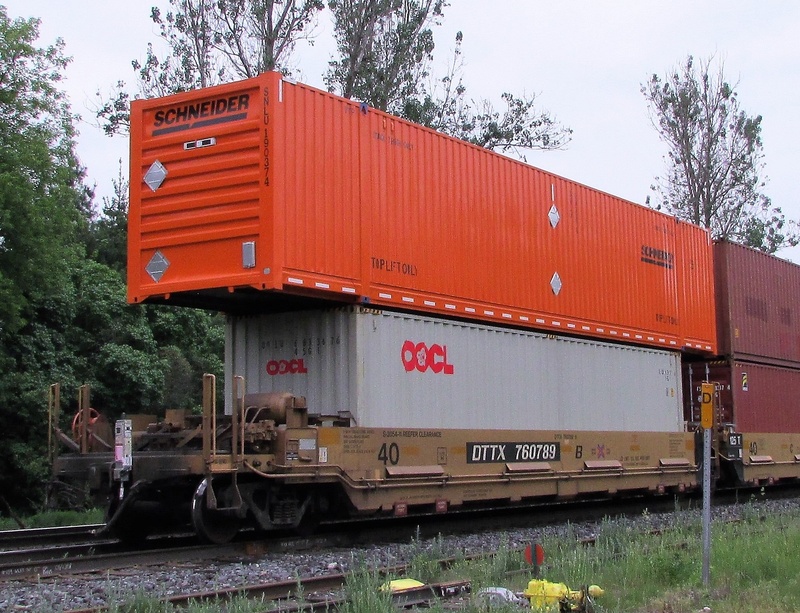 It is equipped with a fifth wheel so a semi trailer could be loaded in it. 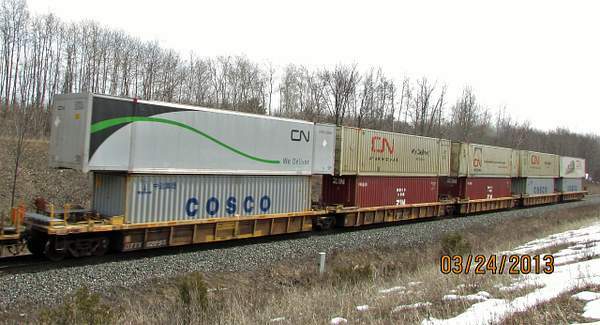 EMHU 648434 over EMHU 262172 loaded on a CN/GTW well car travelling on CP train. 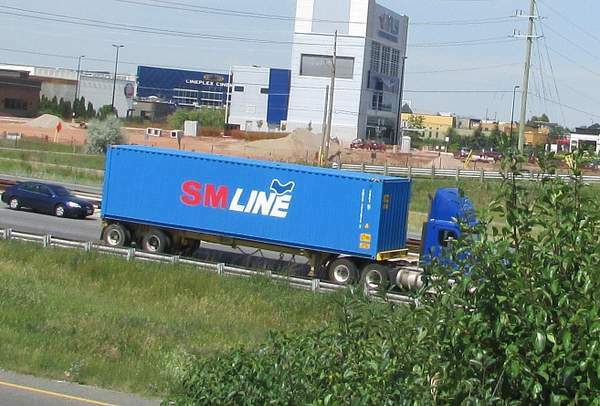 Normally a grabbed shot of a container on the highway isn't worth keeping but SM LINE is a new container company fir the Asia - North America run. First sighting of this company. 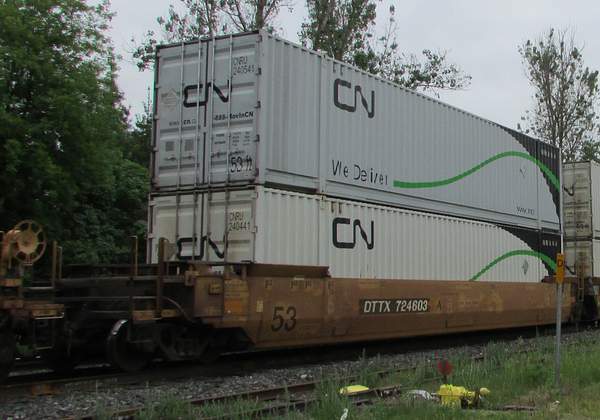 CN train 148 June 2 2018. 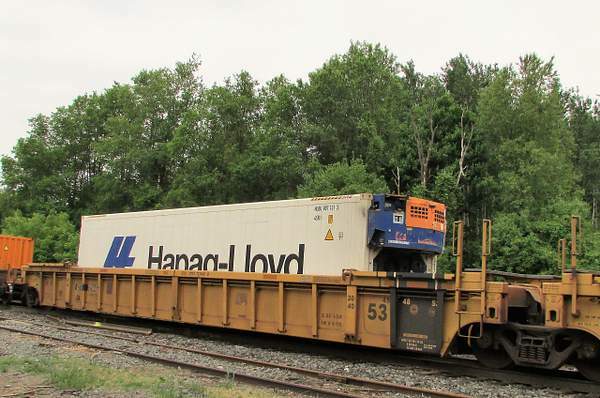 CHICAGO loaded June 1 Shipped rail June 1 @19:12 moving to Halifax via Montreal to arrive June 6 to be loaded on MV Atlantic Sea June 7 to arrive in Liverpool England June 13 on Hapag Lloyd. 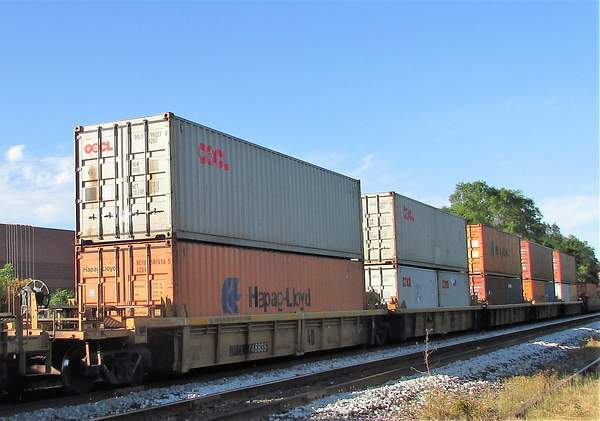 53 foot domestic container moving train CN 148.